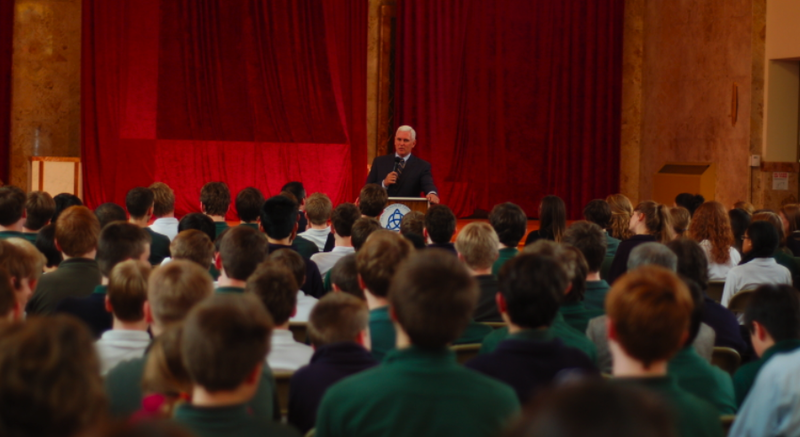 Governor Pence addresses Trinity School students, faculty and guests. 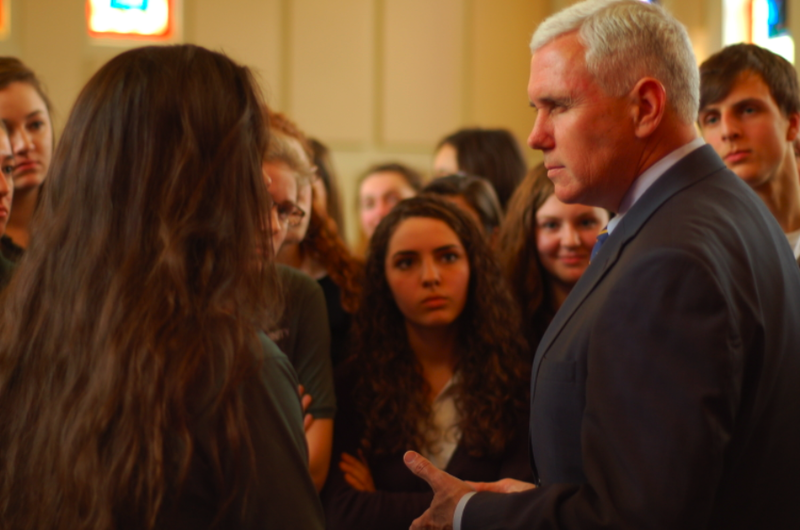 Students talk with Governor Pence. The governor told the students about his childhood growing up in the small town of Columbus, Indiana. He said that a pivotal moment of his life came at age 18, during his years as a student at Hanover college, when he “made the decision to trust Jesus Christ as my Savior.” He went on earn a law degree and serve six terms in Congress, before becoming governor of Indiana in 2013. His advice to students: “Make sure that you take time at this time in your life to grow in the inner man and the inner woman. Work to become the kind of person that people will follow, and that begins with character, wisdom, understanding and compassion,” ideals already on display at Trinity. Head of School John Lee presented the governor with some gifts from the school, including a Blue Ribbon t-shirt and a copy of The Peloponnesian Wars, written by the Greek author Thucydides in the 5th century B.C. “It’s a great read,” John told the governor. Such encouragement from the governor to our students to hear he trusted Christ at a young age! Trinity you are cutting edge in this day and age! Trinity is a wonderful work of God's! 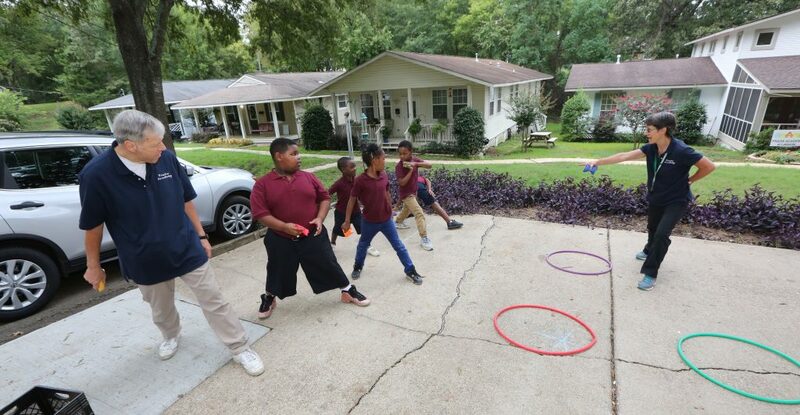 The recognition of its impact is wonderful to see in the lives of our alumni. Surely, God is establishing his Kingdom very concretely! Glory! Thank you V&B for the great coverage! Praise God for Gov. Pence's visit to Trinity today. He seemed genuinely happy to be with us and duly honored Kerry, John Lee,the faculty and students. The governor also called the students on to greatness and encouraged them to live in Indiana :) Now on to our 5th Blue Ribbon-praise God. Great recognition for Trinity Schools, the leaders and teachers, and students! We are all proud of you and we encourage you to paddle strong for continued growth and honors. Keep the canoe pointed toward the horizon!! Congratulations to Trinity staff and students over the years for your perseverance and dedication to this work of making a difference in education throughout the country. May the Lord continue to guide you all in this mission and labor of love.